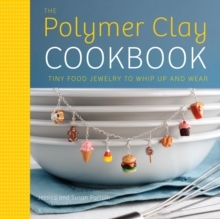 "The Polymer Clay Cookbook" celebrates favourite foods with 20 tiny, deliciously realistic food charms to make from polymer clay and fashion into unique jewellery. Styled as a cookbook for the beginning miniaturist 'chef', the introductory chapters discuss the 'basic ingredients' and techniques used for polymer clay and jewellery-making. The remainder of the book offers 20 'recipes' grouped by category: fruits, breakfast, lunch and dinner, sweets and snacks, and holiday foods. Each recipe has a list of 'ingredients', step-by-step directions with photographs and suggested variations. Each piece is presented as a particular finished jewellery item, such as a necklace, but readers are encouraged to adapt the piece into any type of jewellery they choose.